It’s the start of a month and the start of GenCon, so this is an interesting time to check in on ENWorld’s list of hot RPGs. (It’ll be particularly interesting to see how the buzz from GenCon affects the discussion landscape in the next month or so.) Usual reminder applies: RPGs are scored on the chart based on what’s being actively discussed on as wide a pool of internet fora and blogs as ENWorld can find RSS feeds for. It isn’t tracking sales, and it isn’t even tracking popularity (because conceivably a game could get onto the chart if there were a sufficiently virulent negative reaction to it). What I present here are the scores assigned to each game, not the percentages (which can tend to obscure whether there’s been a recent explosion of RPG discussion – for example, as associated with the D&D 5E release – or whether things are comparatively quiet on the RPG talkosphere). Note that yet again the OSR score includes a contribution from Stars Without Number, which is also tracked separately. I’ve had a fancy for a while to go old-school and check out some hex-and-counter wargames, and one of the most convenient ways to get a feel for them seems to be through the auspices of Strategy & Tactics and its sister magazines World At War and Modern War. These magazines all come in two editions: a magazine-only version for those who only really care about the military history articles they pad out their page count with, and a version which comes with a free hex-and-counter wargame – a tradition that Strategy & Tactics has maintained since the 1960s. In order to test the waters, then, I decided to pick up issues of each of these magazines to test-drive the games in question. As it happened, the 40th issue of World At War happened to include not just one but two games, both of them solitaire affairs, allowing me to jump right into it. They are easier to modify than videogames. Not only are all the rules of a hex-and-counter tabletop game directly known to all the players (whereas in a computer wargame some of the rules aspects might be obscure), they’re also able to be changed at a moment’s notice. If you find a particular rule isn’t working or enjoyable, you can stop using it or change it immediately. Conversely, if some aspect of a computer wargame bugs you, removing it is not so straightforward (and may be effectively impossible if the game isn’t particularly modder-friendly) if the game designers didn’t think to include the option to change or remove it. They lend themselves to higher-level decision-making. Let’s face it, although an individual miniature in a miniatures wargame doesn’t necessarily have to represent a single person, there’s a tremendous tendency to think of it that way anyway, particularly if it’s a more detailed miniature – and if you like miniatures at all, you probably dig the fine details of them. Sure, Epic-scale Warhammer 40,000 games have minis representing large numbers of people, but let’s face it – those tiny little things just don’t look as good as 28mm or even 15mm scale miniatures, and the 6mm scale used in Epic is about as small as miniatures can get. Conversely, a single counter in a hex-and-counter wargame can represent a whole army without a shred of cognitive dissonance whatsoever. The publishing model lends itself to fine simulation of very specific scenarios. 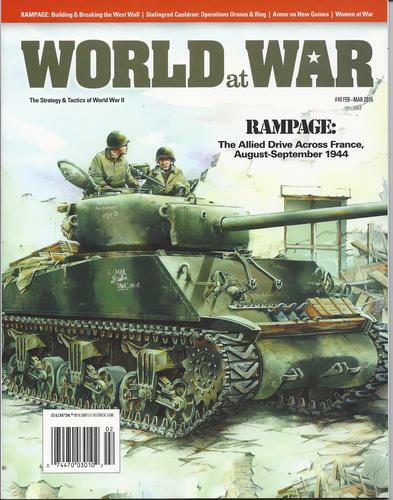 Part of this may be down to the magazine format – if you’re editing World At War and you know you need to provide a new World War II-themed game every issue, then it makes sense to greenlight more games modelling specific battles or events of the war rather than running World War II: The Game every issue. But on top of that, looking at the games advertised in the magazines and available out there on the market, the trend does seem to definitely favour games in which predrawn maps and predetermined troop setups are provided and the action is based either on a specific historical incident or a particular “what-if” scenario. Conversely, miniatures wargames seem much more open to setting up terrain on an ad hoc basis and running a wide variety of different scenarios with your minis, which kind of makes sense: nobody’s going to pay money for a bunch of miniatures they can only play one very specific scenario, and likewise nobody’s going to pay money for a hex-and-counter game where you have to draw your own map and customise your own counters. Effectively, in a minis wargame you are paying primarily for the minis and secondarily for the associated rules system, whereas in a hex-and-counter game you are often paying for the research and creativity which went into designing the scenario and then secondarily for the associated rules system. That being in mind, let’s see how these solo scenarios panned out. One of those games that was originally put out through a small press before Fantasy Games Unlimited acquired it and put out a more widespread new edition, Bushido is one of those RPGs that has a comparatively low profile but whose influence is surprisingly extensive. 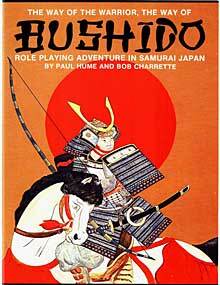 Bob Charrette and Paul Hume, its authors, would be commissioned to produce the Land of Ninja supplement for 3rd edition Runequest, which effectively amounts to a conversion of the Bushido setting to Basic Roleplaying, and the influence of Bushido‘s honour system and class breakdown can be seen in later products such as Gary Gygax’s Oriental Adventures. According to Designers & Dragons, the Legend of the Five Rings gameworld was first developed after AEG explored the idea of making a new edition of Bushido but decided against paying the extortionate price required to get it out of the FGU IP black hole. 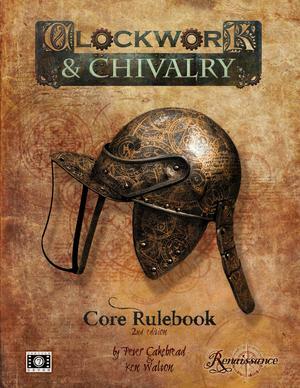 In the not-too-distant future one of my Monday night group is going to be running some of Peter Cakebread and Ken Walton’s Clockwork & Chivalry, so I thought I would check it out. The conceit is that it’s set during an alternate version of the English Civil Wars of the 1600s (exactly how many Civil Wars were fought in that period is apparently a non-trivial question). The twist is that Parliament, supported as it is by the craftsmen and merchants of the middle classes, can bring a range of amazing clockwork devices to bear on the battlefield; meanwhile, the Royalist forces bolster their chances by turning to alchemy, and whilst most of those persecuted for witchcraft in this age are innocents, there are a few genuine Satanists with true magical power lurking in the shadows. The default starting point for the game is the aftermath of the Battle of Naseby, which deviates from the result in our world due to it being the first fight where the various clockwork and alchemical contrivances were used on the battlefield. In this version, King Charles was captured and quickly executed by Oliver Cromwell, who has declared himself Lord Protector; however, the Royalist forces under Prince Rupert of the Rhine still control significant sections of the country (King Charles II is too young to lead the war at the moment, so he is staying in Paris with his mum). An uneasy break in the fighting has occurred as both sides come to terms with the twin shocks of the apocalyptic battle of Naseby and the sudden regicide following it – but surely that cannot last. So, today I enjoyed a brand new miniatures wargaming experience which rekindled my enthusiasm for the hobby. 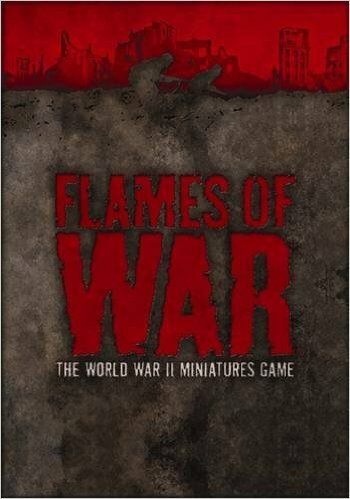 That’s right, I’ve had my first game of Flames of War. (What do you think I was talking about? Age of Sig-who?) Enough of my friends had been getting into it that I thought it was worth a look, especially considering that 15mm scale World War II miniatures are very competitively priced – for a small outlay I was able to put together a battlefield force that allows me to field a legal army at a wide range of points values and with plenty of options at each level, using a combination of newly bought miniatures from the publishers and the Plastic Soldier Company (one advantage of historical miniatures gaming is that no one company owns the IP on the past…) and some second-hand minis bought from a friend who was rationalising their army selection. Even setting aside the second-hand purchase, this was at a fraction of the cost that required to get a comparably large and diverse force for a Games Workshop army. Even so, it’s still wasted money in my book if you don’t actually get to play with the miniatures and enjoy yourself when you are playing with them, and today’s go at Flames of War has convinced me that the game is a bit more of a keeper than my previous brief engagements with Warhammer have been. Another month, another check in on ENWorld list of hot RPGs. Usual reminder applies: RPGs are scored on the chart based on what’s being actively discussed on as wide a pool of internet fora and blogs as ENWorld can find RSS feeds for. It isn’t tracking sales, and it isn’t even tracking popularity (because conceivably a game could get onto the chart if there were a sufficiently virulent negative reaction to it). What I present here are the scores assigned to each game, not the percentages (which can tend to obscure whether there’s been a recent explosion of RPG discussion – for example, as associated with the D&D 5E release – or whether things are comparatively quiet on the RPG talkosphere). Note that according to the chart page a 0 score doesn’t mean nobody’s mentioned a particular game – a statistically significant sample has shown up but no more than that. For sanity’s sake I’m only tracking zero-scores which previously scored. Games which did not chart presumably either failed to even yield a statistically significant sample or have had their categories retired from the chart (as appears to be the case with the redundant Dnd/Pathfinder category). At least, that’s according to the ENWorld writeup – though since I’ve not seen a game drop off the chart since the Dnd/Pathfinder and Stage categories dropped off, I’m sceptical about that. Note also that the “OSR” entry should be taken with a pinch of salt – it’s the accumulated score of a whole bunch of OSR games, but this includes Stars Without Number which also has its own, separate entry, as well as systems not based on old school D&D like ZeFRS and, bizarrely, BRP. In short, it’s a farce as huge as combining all the Narrativist-influenced games into a Forge category and simultaneously giving them individual listings anyway. I really don’t know why they do it.